Since last year when Amazon announced it was searching for a second city to house its new headquarters, investors have been anxiously waiting to hear where they would choose. This week Amazon announced its final decision and there was not one, but two winners: Long Island City in Queens, New York City and Crystal City, Virginia (Northern Virginia city in the Washington, DC suburbs). As I discussed in January on the blog, Amazon is a game changing prize. It's bringing 25,000 new jobs to each city (at an average salary of $100K per position - that's $2.5 Billion injection per year per city) PLUS a combined total of $5 Billion in new capital expenditures to these areas. And it’s not just what Amazon itself will do… there will be all sorts of secondary and tertiary businesses that will blossom to support this gigantic new corporate citizen - creating even more jobs and economic opportunity in the market. These secondary and tertiary businesses will include the real estate businesses that house all the new employees and other businesses that support Amazon. In other words, commercial and residential real estate will be in high demand. If you're already a property owner in either of these markets -- congratulations! You're almost definitely going to see appreciation and rising rents in your properties. That's a great thing! If you're not yet an owner in these markets or were thinking of buying more properties in these markets, should you rush to buy? The answer is it depends on you and your goals, but for the majority of goddesses, I would say ...not so fast. You may find that surprising. Why shouldn't you rush to buy in these markets? If it's good enough for Amazon, shouldn't it be good enough for you? Well, unlike you, Amazon is a trillion dollar company. They have very deep pockets, unique needs, and the muscle and clout to have the rules and regulations changed to help their investment be more profitable. While there is overlap, what makes for a good market for them is not going to be the same criteria as what is good for you. New York City only meets up to 4 of these market factors. Northern Virginia up to 5. New York City has high job and population growth (3). It has a very diversified local economy (4). If you can purchase in Queens where Amazon will be located, you'll definitely be in the right submarket (6). And if you don't already have familiarity with the market, you can develop it or partner with someone with does (5). Where the city is lacking is that it is not particularly landlord or business friendly. As I wrote in the blog post "This is One of the Most Important Property Market Considerations," When you are investing in real estate, you (a) are a Landlord and (b) have a real estate business. It’s best to invest in communities that are friendliest to landlords and businesses. New York State, as a whole is actually fairly landlord friendly. Various restrictions in New York City, however make it very difficult for small landlords. New York is also not the most business-friendly market. In this Small Business Friendliness Survey as reported by CNBC, New York only scored a D+. Another challenge with investing in NYC is that it has a very high cost of housing. It's actually the most expensive city per square foot in the entire country. With high cost of housing, the barriers to entry are higher and it's tougher to get your return on investment. Last, but not least, you're not buying in the right market cycle. There are four market cycles: rising market, boom markets, downturns, and stabilized markets. It's ideal to buy in a rising market (growing, but prices haven't hit peak). In a boom market, buyers are flocking in and it becomes a seller's market. By definition, a sellers' market is bad for buyers. You're paying more money for less return. Amazon's decision is only going to exacerbate this Boom Market, not reduce it. 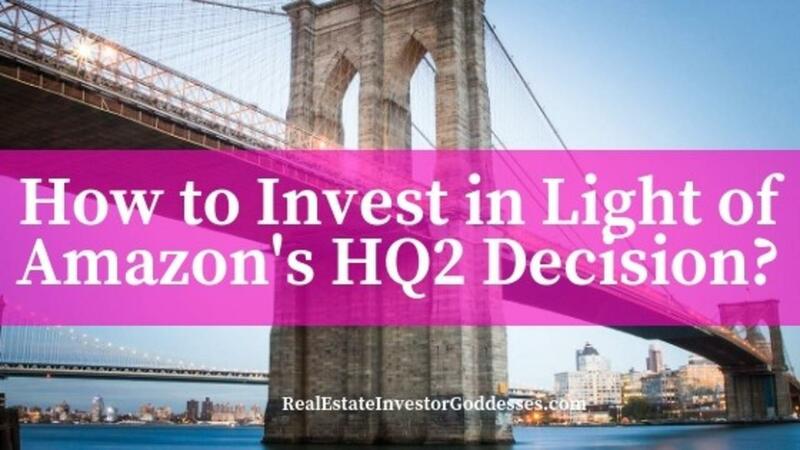 Investors are already flocking to purchase, and interest in Long Island City where Amazon will be located has increased 248% just this week! If you're very connected and/or can think creatively, there are opportunities to make money in a boom market, but it's definitely a lot tougher. Like New York City, Northern Virginia has high job and population growth (3). It has a very diversified local economy (4). Many of its businesses service the national government - so they're fairly recession proof. Crystal City, where Amazon will be headquartered is a great submarket with lots of opportunity (6). And if you don't already have familiarity with the market, you can develop it or partner with someone with does (5). Additionally, Virginia is very business friendly (1). It ranked 4th in CNBC's Top States for Business 2018. Northern Virginia is fairly tenant-friendly, but not excessively so. There is no rent control, a tenant cannot withhold rent for any reason, and tenants can generally be evicted for failure to pay rent within 3 to 6 weeks. The challenges with Northern Virginia is that it has a very high cost of housing. Home sale prices continue to skyrocket in Northern Virginia. Also, as is the case in New York City, you're not buying in the right market cycle. It is also a boom market, that is being exacerbated by Amazon. Interest in Crystal City has grown 84% this week. There are probably markets and submarkets close to these Amazon hubs that will still benefit from the Amazon infusion of jobs and capital to the area. Search for nearby areas that meet all 7 criteria, and then definitely jump in. Whether you invest in New York or Virginia, keep an eye out for what Amazon does to these markets. It will definitely be interesting!